It was a night of impressive debuts, brutal finishes, and fond farewells as Shamrock FC returned to it's familiar haunt at the Lumiere Casino on Saturday night. Cape Girardeau's "Mad" Max McNeely came in a with a calculated strategy and spoiled Bo Kunz's retirement match with a quick first round finish. McNeely, making his professional debut, quickly closed the distance on Kunz and grounded the fight, after getting back to his feet, McNeely quickly took Kunz down again. Working from side control McNeely forced Kunz to turtle where he was able to get the back his back before locking on a fight-ending rear naked choke. A disappointed Kunz thanked Shamrock, his fans and supporters as he rode off into the sunset with a smile on his face ending his professional fighting career at 3-3. Meanwhile McNeely improves to 1-0 on his debut and looks to stay active hoping for at least one more fight by the end of the year. When pressed, McNeely mentioned Byron Stevens as a possible opponent down the road. Dewayne Diggs out of River City Warriors wisely avoided the stand-up of hard-hitting Kyle Walker, and used his jiu-jitsu to take home a victory. After trying to pull guard from the clinch, Diggs found himself in Walker's d'arce choke. After maneuvering to the side, Diggs was able to take the back of Walker after forcing the scramble and was able to finish the fight with a rear naked choke.. Diggs improves to 2-0 with his other win coming over Jason Christenson at Bellator this past June. Finney MMA's Ryan Sutton looked completely rebuilt in his match with Justin Grant. Sutton looking to shake the "just a wrestler" moniker, looked much more comfortable on his feet than previous outings, but what really impressed was his transitions on the ground, as he quickly submitted his opponent with an arm triangle. Sutton evened his record to 4-4. In a fight of the night worthy performance, flyweight Kris Craig evened the score with Erik Newman in a rematch for the SFC Amateur title. Craig was noticeably stronger and when the fight went to the ground Craig bullied the tall and lanky Newman when the two were clenched. A scary more for Craig in the second when he found himself in Newman's calf slicer, but the resilient Craig refused to tap. Newman started to land his kicks in the third, but decided to return to the ground where Craig took over and spent the remainder of round working his ground and pound, winning him the round, the fight, and a shiny new belt. An impressive showing from Watson Martial Arts standout Colin Parr. There's some great jiu-jitsu coming out of Watsons and Parr was no exception, winning via armbar in less than thirty seconds of his fight with Jake Willyard. Parr's armbar was so tight it appeared to dislocate the elbow of Willyard. According to our record that's the fifth win for Parr who is an amateur welterweight to keep your eye on. Brandon Nehls, fighting out of Hahn's MMA in Arnold was suffocating in his win over Carl "Prez" Jefferson. Nehls returned to chage after almost two years on the sideline, and wasted no time getting the fight to the ground, wanting no part of the stand-up. Nehls worked out of Jefferson's guard for almost the entire fight, but wasn't able to get a finish. Jefferon's best round was in the second when he worked for a couple of submissions wasn't able to get one to stick. The win improved "Skeletor" to 7-1. Greg Freund and David Grant grappled for three rounds with Freund winning the first and third rounds and ultimately the decision. Freund was just a little sharper with his control, and spent more time on top, scoring points with the judges. Second generation MMA prospect Dustin Ventimiglia was dominant in his bout with Perry Nesbitt. Nesbitt had no answer for Ventimiglia's takedowns, who spent almost the entirety of the fight on top before getting the TKO late in the third. 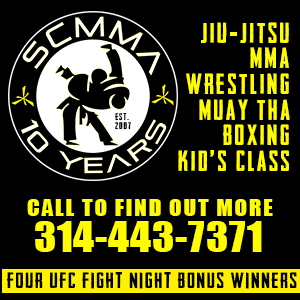 Ventimiglia from the War Room in Alton, IL has a very bright future following on the footsteps of his father who was one of the pioneers of MMA in the Midwest in the late 90's early 2000's. The future of the women's division was on display as Izzie Robinson made short work of Kato Drobena with a flawless takedown and heavy ground pressure before setting up a rear naked choke. Kevin Mueller slowly and systematically broke the will of opponent Nik Willyard finishing with a TKO midway through the second round. Near the end, Mueller had Willyard pinned against the cage and landed a series of head kicks to a hunched over Willyard who looked ready to call it. Dylan Hatley and James Williams kicked things off on the night. With some wild, but creative offense, Hatley picked up a decision victory in a fight that he thoroughly dominated. Hatley landed a powerful suplex throw in the first to get the crowd going, early. Shamrock FC returns to Lumeire on November 5th for Xtreme 9.